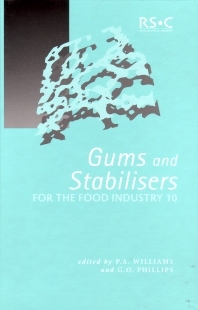 The tenth volume of "Gums and Stabilisers for the Food Industry" provides an up-to-date account of the latest research developments in the characterisation, properties and applications of polysaccharides and proteins used in food. Polysaccharide characterisation; Polysaccharide gelation; Mixed biopolymer systems; High solid systems; Proteins and emulsions; Recent developments, future trends. Peter A. Williams is a director of the Centre for Water Soluble Polymers. Glyn O. Phillips is Chairman of Phillips Hydrocolloids Research Ltd, UK. Glyn O. Phillips is a internationally renowned expert on hydrocolloids and food proteins. Along with Peter A. Williams he was the founder of the international journal Food Hydrocolloids, founding Directors of the Food Hydrocolloids Trust and the Gums and Stabilisers for the Food Industry Conferences.